BMI (Broadcast Music, Inc.) is pleased to celebrate an evening of exceptional songwriting at its 67th Annual BMI Pop Awards. In an event 22 years in the making, Sting, already a BMI Icon, will be honored for his enduring hit single "Every Breath You Take," which has become the Most Performed Song in BMI's catalog of over 14 million musical works. The award ceremony will also celebrate multi-platinum GRAMMY Award-winning band Imagine Dragons with the BMI President's Award, and Martin Bandier, legendary music publishing executive, will be named a BMI Icon, the first time a music publisher has been given this honor. The private event will be hosted by BMI President and CEO Mike O'Neill and Vice President Worldwide Creative Barbara Cane and will take place on Tuesday, May 14th at the Beverly Wilshire Hotel in Beverly Hills, CA. "We couldn't be more excited for this year's ceremony which honors the best of the best in pop music and celebrates songwriting at its finest," said O'Neill. "For the first time in 22 years, BMI has a new top song in our repertoire with Sting's timeless hit 'Every Breath You Take,' a remarkable achievement that solidifies its place in songwriting history. It's a milestone that demands a special tribute." O'Neill added, "We are also thrilled to celebrate the groundbreaking artistry and creative vision of Imagine Dragons who have become one of the most compelling rock bands of the last decade and a most deserving recipient of our President's Award. And, when you think of music icons, Marty Bandier certainly falls within that category. BMI is thrilled to honor him for his indelible imprint on all facets of the music industry." With nearly 15 million radio plays, Sting's "Every Breath You Take" has become the Most Performed Song in BMI's catalog, a distinction previously held by Mann and Weill's "You've Lost That Lovin' Feelin'" for the last 22 years. 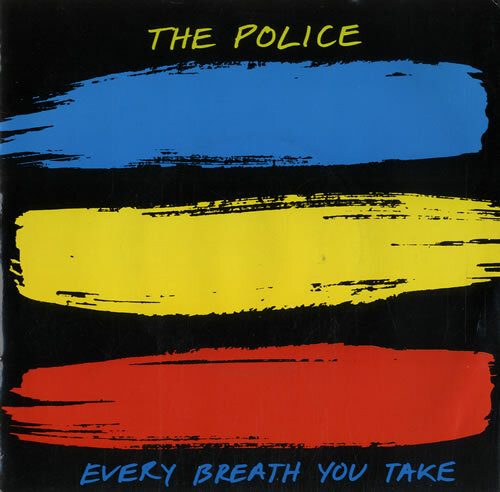 Written by Sting and performed by The Police, "Every Breath You Take" became a hit in 1983 before its 1995 resurgence with "I'll Be Missing You" by P. Diddy, Faith Evans and 112. In 2016, Sting was honored as a BMI Icon and also accepted a BMI Million-Air Award to recognize 13 million combined radio plays at the BMI London Awards where he said: "…your real job as a songwriter is to provide a soundtrack to people's emotional lives, touchstones for their emotional landscapes, their memories. And that's an unexpected and unanticipated honor as well as a privilege." His new album, My Songs, will be released on May 24th and features a modern approach to some of his favorite hit songs, including "Englishman In New York," "Fields of Gold," "Shape of My Heart," "Roxanne," "Message In A Bottle," "Every Breath You Take" and many more. Cane remarked, "As one of today's most influential global artists, Imagine Dragons is transforming music and culture with riveting, dynamic and powerful songs. We're thrilled to celebrate them as well as all of our other wonderful honorees." STING: Since forming The Police in 1977 with Stewart Copeland and Andy Summers, Sting has evolved into one of the world's most iconic artists, selling 100 million records and earning many of the industry's highest accolades both as a member of The Police and as one of the most distinctive solo artists of our time. These honors include 17 GRAMMY Awards, more than 30 BMI Awards including the BMI Humanitarian Award (1997) and the BMI Icon Award (2016), four Brits, a Golden Globe, an Emmy, four Oscar nominations and induction into The Rock and Roll Hall of Fame, among many others. His new album, My Songs, will be released on May 24th with a summer tour kicking off in Paris on May 28th. The collection of songs will feature a modern approach to some of his favorite songs, including "Englishman In New York," "Fields of Gold," "Shape of My Heart," "Roxanne," "Message In A Bottle," "Every Breath You Take" and many more. IMAGINE DRAGONS: Since forming in 2009, lead vocalist Dan Reynolds, guitarist Wayne Sermon, bassist Ben McKee and drummer Daniel Platzman of Imagine Dragons have emerged as one of the biggest and most compelling rock bands in the world. The group burst on the music scene in 2012 with its first full- length album Night Visions, featuring hits "It's Time," "Demons" and "Radioactive," which won the band a GRAMMY for best rock performance. The band has gone on to release three more studio albums, Smoke + Mirrors (2015), Evolve (2017) and Origins (2018). That same year, the band became the first act to keep four songs on the Billboard charts for a full year, including the massive hit "Thunder," which peaked at No. 4 on the Billboard "Hot 100″ chart in 2017 and has more than 1.1 billion views on YouTube. The celebrated group has also received many accolades including three American Music Awards, nine Billboard Music Awards, six BMI Awards for "Most Performed Song of the Year," a GRAMMY, an MTV Video Music Award and a World Music Award.